Get your Driver Helpful DOT Physical Exam at our convenient clinic located in the Murraywood Centre at 7001 St. Andrews, Suite B9, in Columbia, South Carolina. In addition to welcoming commercial drivers, we are a family practice clinic specializing in occupational health services and treatment of primary care health concerns. We offer compassionate health care to children (2 years and older) and adults. We have an onsite lab for point of care testing. There is no need to go somewhere else for your DOT physical, diagnosis or treatment; we offer the exam and the treatment, if necessary. Need your CDL Physical Exam Today? We know your time is valuable! Same Day Appointments, just give us a call! No Waiting! We are committed to getting you back on the road in no time. We offer fast friendly service and welcome individual drivers as well as motor carriers. Worried About Passing Your CDL Physical Exam? Our office knows how important it is that you continue your livelihood as a commercial driver. With her extensive knowledge of the DOT Physical Exam medical guidelines, Janeen Wood FNP-C will steer you through the DOT Physical Exam requirements so you can Keep on Truckin’. Not sure if your medical condition will affect your driving status? Just give us a call before your appointment. We are here to answer your questions. Whether you are just traveling thru Columbia, SC or one of our local drivers, we are here for you! Our Contact Information at your fingertip! Go to the Apple App Store, or Google Play and download the TeamCME Mobile Driver App for IPhone and Android devices and save our office as your DOT Medical Examiner so you can contact us with a tap of your fingertip. Never Forget to Renew your Certificate! With the full featured TeamCME Driver Mobile App, you’ll get “Expiration Alert” beginning 1 months before your certificate expires.! Looking for a DOT Physical Exam or CDL Physical Exam in Columbia, SC? You’ve come to the right place! Take I-26 East to Lake Murray Blvd/South Carolina 60 West, Exit 102 A. Merge onto SC-60 W/Lake Murray Blvd, go 1 mile. Turn Left onto St. Andrews Rd. Go 0.8 mile and turn Right at the light at the Murraywood Centre corner. We are located at the back of Murraywood Centre, Suite B9. Take I-26 West to Lake Murray Blvd/South Carolina 60 West, Exit 102 A. Merge onto SC-60 W/Lake Murray Blvd, go 1 mile. Turn Left onto St. Andrews Rd. Go 0.8 mile and turn Right at the light at the Murraywood Centre corner. We are located at the back of Murraywood Centre, Suite B9. Janeen Wood grew up in the Irmo/Chapin area. She is happy to call Irmo home again with her three children and husband. Janeen completed her Bachelor of Science degree in Public Health, with an emphasis in Education from Utah State University. She simultaneously completed her ADN degree from Weber State University and became a Registered Nurse in 1998. She worked in Cardiac Critical Care, Telemetry, New Born Nursery/Post-partum care, and School Nursing, before returning to school to earn her Master of Science Degree in Nursing from Frontier Nursing University in 2011. 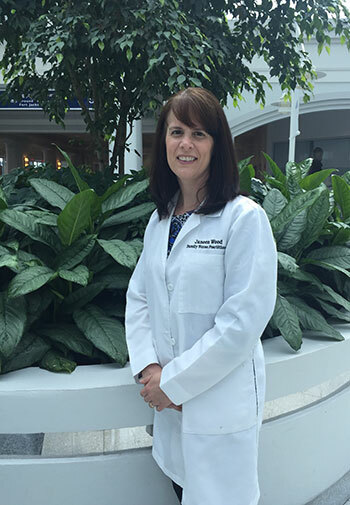 She has worked in Primary Care/Family Medicine, Occupational Health, and Internal Medicine since becoming a Certified Family Nurse Practitioner.